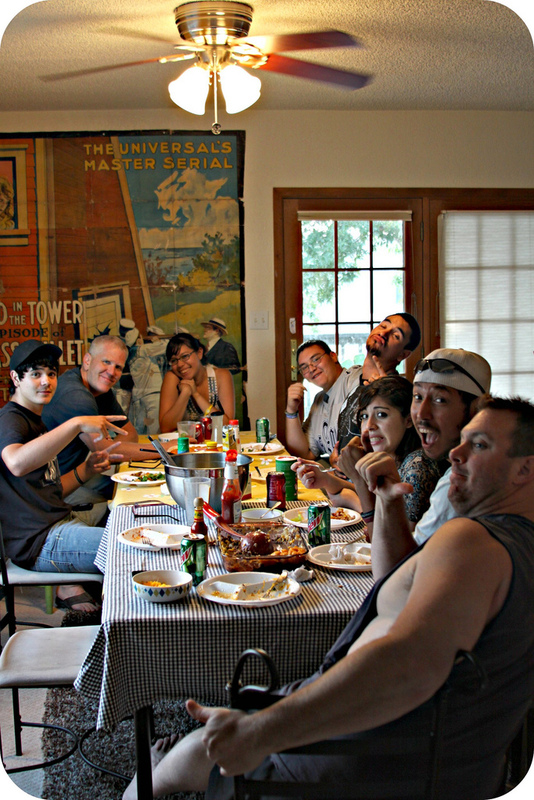 Our family just recently decided to invite some friends over for a BIG family dinner. And then we decided we should make a habit of it. In just a year & a half, our friends here have pretty much become our family & it's nice to have a connection like that, being so far from "home". Once a month we all pitch in with food & drinks & round up the tables & mismatched chairs & sit together for some food & chillin'. All 13 of us. (The kids were eating dinner in the kitchen, picnic-style.) Tonight's menu consisted of a great big green salad & 2 large tater-to casseroles. In between "Pass the ketchup!" & "Where's the cheese?" we even went around the table & shared our "high's" & "low's" of the week & what goals we hope to accomplish next week. It was nice. Really, really nice.